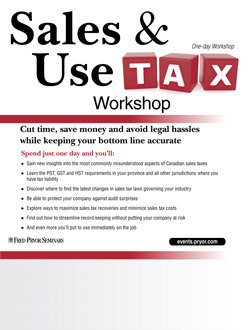 If you have questions about sales and use tax laws, you're not alone. With four provinces still levying a general Provincial Sales Tax (PST), eight provinces and territories applying 5% Goods and Services Tax (GST), and the remaining five provinces now under Harmonized Sales Tax (HST) with two separate rates, it is difficult to be sure which tax should be charged or paid and at what rate. The transition to HST in British Columbia and Ontario has added a complexity that has never been seen before. Canada is one of the very few countries in the world with a single stage tax (PST) and a value added tax (GST and HST), adding to the confusion. To add to your challenges, every level of the government is attempting to increase revenues. Clearly, your job has never been more difficult — or important — to your organization. Your company depends on you to know the law regarding sales tax and make sure it is in compliance. This one-day workshop will arm you with the knowledge you need to meet the expectations of management — and the government. With the information you learn, you could cut your organization's tax payments substantially and even receive refunds. Most importantly, however, you'll gain the peace of mind that comes from knowing that you truly understand these complicated tax laws. Reporting options and requirements — alleviate frustration, and get it right the first time! Must-have documents to keep available in case of an audit — can you put your hands on them in a hurry? The audit process — what to expect, how to prepare, record-keeping essentials "just in case"
Allowances and reimbursements — tax recovery or tax expense? Public Sector Bodies — sales tax really matters to these customers — have you got it right?